[S49] UK National Census for 1881 Index, UK "RG11/3801 f171 p7." GRO Reference: 1873 S Quarter in LEIGH Volume 08C Page 206." GRO Reference: 1873 D Quarter in LEIGH Volume 08C Page 120." [S1] Website IGI (www.familysearch.org) "C161601." [S684] Burial, St Luke (Lowton), 1813-1889 "p150/1199." [S48] Online index to the UK National Census for 1901 for UK "RG13_Pc-3588_Fo-61_Pg-25 156." 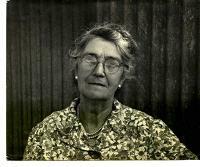 [S45] Website FreeBMD (http://freebmd.rootsweb.com/) "Births Jun 1871 HIBBERT Sarah Alice Chorley 8e 487." [S48] Online index to the UK National Census for 1901 for UK "RG13/3583 f109 p16 92." 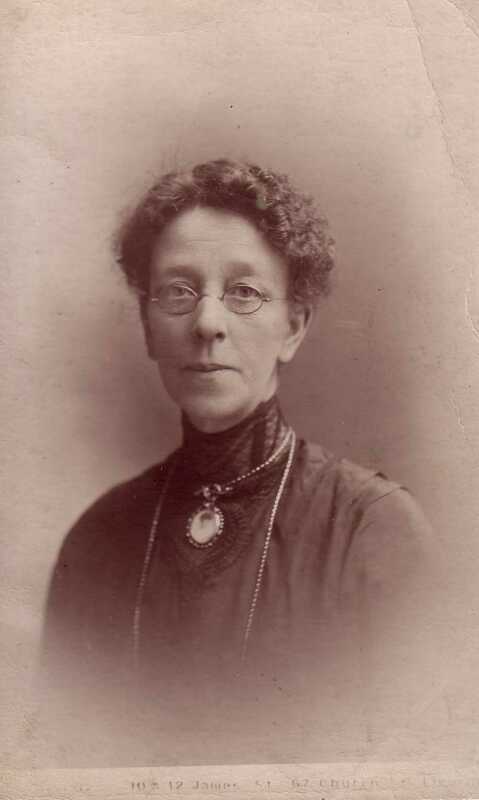 [S45] Website FreeBMD (http://freebmd.rootsweb.com/) "Births Mar 1869 HIBBERT Thomas Leigh 8c 194." [S2260] UK National Census for 1911 for UK, "RG14PN23150 RG78PN1353 RD459 SD4 ED20 SN228." [S2] UK National Census for 1871 for UK, "RG10/4197 f35a p18 98." [S37] Website Cheshire BMD (http://cheshirebmd.org.uk/) "C25/14/357." [S1088] Website Lancashire OPC (http://www.lan-opc.org.uk) "Baptism: 25 May 1890 St Elphin, Warrington, Lancs. [S1088] Website Lancashire OPC (http://www.lan-opc.org.uk) "Baptism: 30 Apr 1893 St Elphin, Warrington, Lancs. [S1088] Website Lancashire OPC (http://www.lan-opc.org.uk) "Baptism: 18 Jun 1896 St Elphin, Warrington, Lancs. [S1088] Website Lancashire OPC (http://www.lan-opc.org.uk) "Baptism: 16 Jan 1898 St Elphin, Warrington, Lancs. [S1088] Website Lancashire OPC (http://www.lan-opc.org.uk) "Baptism: 17 Sep 1899 St Elphin, Warrington, Lancs. [S1088] Website Lancashire OPC (http://www.lan-opc.org.uk) "Baptism: 22 Sep 1901 St Elphin, Warrington, Lancs. [S1088] Website Lancashire OPC (http://www.lan-opc.org.uk) "Baptism: 3 Apr 1904 St Elphin, Warrington, Lancs. GRO Reference: 1891 S Quarter in WARRINGTON Volume 08C Page 243." 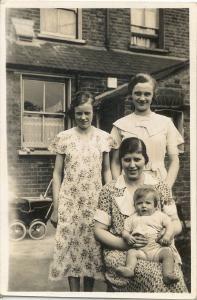 [S45] Website FreeBMD (http://freebmd.rootsweb.com/) "Births Dec 1913 Hibbert Stanley Ravenscroft Warrington 8c 460." [S70] General Record Office Indexes "Mar 1866 Halifax 9a 385 JEFFERSON Aggie." [S298] Baptism, St John the Evangelist (Clifton), 1859-1909 "p23/181." [S2] UK National Census for 1871 for UK, "RG10/4387 f34 p11 56." [S45] Website FreeBMD (http://freebmd.rootsweb.com/) "Marriages Dec 1886 JEFFERSON Aggy Halifax 9a 616." [S45] Website FreeBMD (http://freebmd.rootsweb.com/) "Marriages Dec 1886 WOLMERSLEY Willie Halifax 9a 616." [S287] Microfilm Marriages, ST Martin (Brighouse), 1837-1887 "p242/484." [S72] UK National Census for 1891 for UK, "RG12/3609 f67a p8 51." [S45] Website FreeBMD (http://freebmd.rootsweb.com/) "Deaths Jun 1895 Womersley Aggy 29 Halifax 9a 285. [S880] Website Ancestry (www.ancestry.co.uk) "West Yorkshire Archive Service; Wakefield, Yorkshire, England; Yorkshire Parish Records; New Reference Number: WDP76/1/1/4." [S48] Online index to the UK National Census for 1901 for UK "RG13/3585 32 20a." [S70] General Record Office Indexes "Emma Jefferson Halifax 9a 405 Sep 1869." [S298] Baptism, St John the Evangelist (Clifton), 1859-1909 "p39/305." [S3835] National Health Service Register for UK (online image) "Ref: RG101/7575K/015/20 Letter Code: ZJAH." GRO Reference: 1868 S Quarter in HALIFAX Volume 09A Page 405." [S704] UK National Census for 1901 for UK, "RG13/3585 32 20a 192." 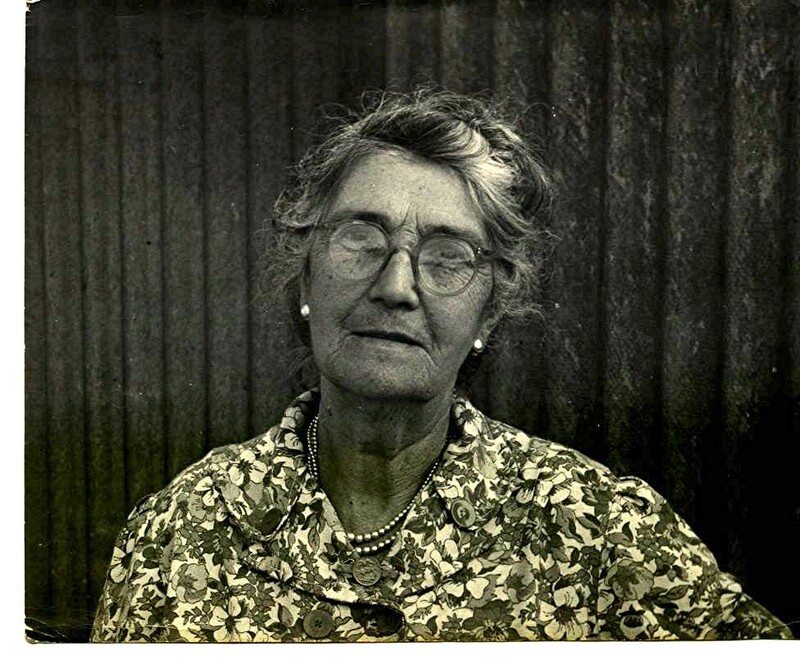 [S70] General Record Office Indexes "Emma Bennett Aled 8a 360 Jun 1947." 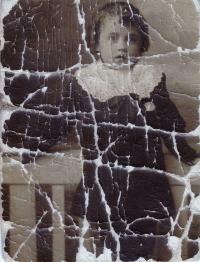 [S258] Copy death certificate of Emma Benett, 12 April 1947 "unknown cd." [S275] Website North Wales BMD (http://www.northwalesbmd.org.uk) "GELE/04A/30." [S2189] Letter from he Parish of Abergele) Margaret Macaulay (PCC Secretary to Alan Bennett, 2 April 2008 "unknown cd." [S2215] MI, Hugh Booth & Emma Bennett. [S396] Copy birth certificate of Frank Bennett, 1 Octobre 1899 "unknown cd." [S257] UK National Census for 1851 Index, Halifax "HO107/2297 f362." [S297] Copy birth certificate of Robert Jefferson Pratt, 16 October 1845 "unknown cd." [S45] Website FreeBMD (http://freebmd.rootsweb.com/) "Dec 1845 Halifax 22 178." [S296] Baptism, St Peter (Hartshead), 1845-1869 "p3/23 Robert Pratt son of Nancy Jefferson Brighouse Spinster born 16/10/1845 bap 30/11/1845." GRO Reference: 1845 D Quarter in HALIFAX Volume 22 Page 178." [S40] UK National Census for 1851 for UK, "H.O.107/2297 f362a p27 102." [S288] Marriages, St Peter (Hartshead), 1837-1877 "p151/301." 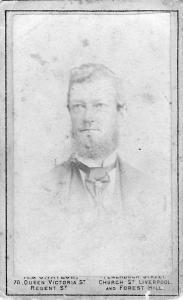 [S70] General Record Office Indexes "Sep 1865 Halifax 9a 638 JEFFERSON Robert Pratt." [S2260] UK National Census for 1911 for UK, "RG14PN26383 RG78PN1524 RD496 SD1 ED15 SN3." [S45] Website FreeBMD (http://freebmd.rootsweb.com/) "Deaths Mar 1913 Jefferson Robert P 67 Halifax 9a 594." 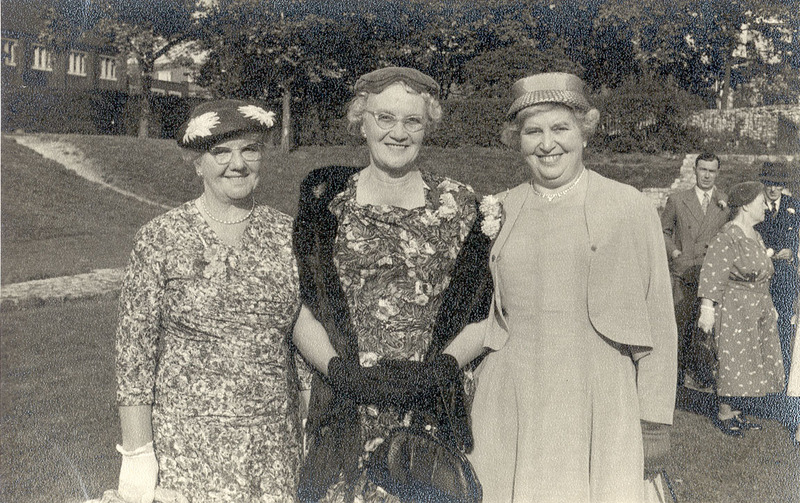 [S748] Marriages, St Paul (Toxteth Park), unknown period "p77/153." [S2260] UK National Census for 1911 for UK, "RG14PN22230 RG78PN1315 RD454 SD2 ED3 SN4." [S1051] Website Lancashire BMD (http://lancashirebmd.org.uk/) "2105TP/16/181." [S442] Copy marriage certificate of Robert Jones and Edith Loughlin, 12 July 1925 "unknown cd." [S532] Marriage, St James (Toxteth Park), unknown period "p91/181." [S1051] Website Lancashire BMD (http://lancashirebmd.org.uk/) "2121TP/5/153." [S2333] Gores, 1938 "54 Grovehusrt Avenue (Knotty Ash) - Anderson Arth. Augustine railwaymn." [S749] Kellys, 1938 "p946 Anderson Arthur Augustine railwayman 54 Grovehurst ave 14." [S2314] Website Toxteth Park Burials (http://www.toxtethparkcemetery.co.uk/dbase/toxsearch.htm) "Anderson, Amy 25 September 1959 53 years - 54 Glovehurst Avenue Liverpool 14 Private Grave 83 132440 14 776 352 CEM 9/1/26." 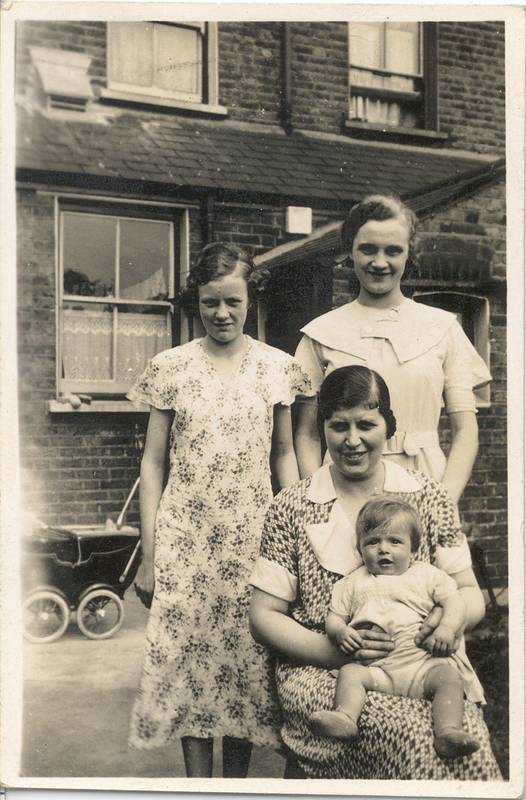 Alma and Peggy Hanlon, with their aunt, Ivy Swindell (née Jones), and cousin Jean Swindell, at Ivy and Ivor's house in Essex Road, Barking, June 1935. [S70] General Record Office Indexes "Deaths Sep 1979 SWINDELL Ivy 6 Oct 1908 Redbridge 14 1243." [S49] UK National Census for 1881 Index, UK "PRO Ref RG11 Piece 3638 Folio 113 Page 2." [S1] Website IGI (www.familysearch.org) "P020279." [S3835] National Health Service Register for UK (online image) "County Borough of Liverpool 453-4." GRO Reference: 1870 J Quarter in WEST DERBY AND TOXTETH PARK Volume 08B Page 322." [S2] UK National Census for 1871 for UK, "RG number: RG10 Piece: 3798 Folio: 33 Page: 59." [S45] Website FreeBMD (http://freebmd.rootsweb.com/) "Marriages Dec 1889 Jones James Toxteth Park 8b 471. 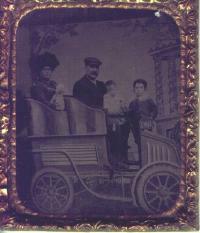 [S45] Website FreeBMD (http://freebmd.rootsweb.com/) "Marriages Dec 1889 MATCHETT Margaret Wallace Toxteth Park 8b 471. [S1051] Website Lancashire BMD (http://lancashirebmd.org.uk/) "2117TP/2/277." [S48] Online index to the UK National Census for 1901 for UK "RG13/3426 f147 p32 189." [S451] James Jones, Medal receipt, 6 July 1921 "unknown cd." [S2314] Website Toxteth Park Burials (http://www.toxtethparkcemetery.co.uk/dbase/toxsearch.htm) "Jones, Margaret Wallace 4 April 1922 54 years Married Woman 120 Northumberland Street Toxteth Park Private 5777 115182 E Left 191 352 CEM 9/1/23." [S3480] Copy death certificate of Margaret Wallace Jones, 30 March 1922 "unknown cd." [S2405] Copy death certificate of James Jones, 25 January 1946 "unknown cd." [S2314] Website Toxteth Park Burials (http://www.toxtethparkcemetery.co.uk/dbase/toxsearch.htm) "Jones, James 30 January 1946 75 years - 21 Maud Street Liverpool Private Grave 134 127870 E Left." 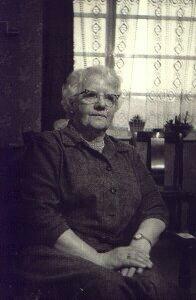 [S70] General Record Office Indexes "Death Mar 1977 JONES Johanna 01 MY 1897 Liverpool 36 0512." [S2314] Website Toxteth Park Burials (http://www.toxtethparkcemetery.co.uk/dbase/toxsearch.htm) "Jones, Johanna 29 March 1977 79 years - 21 Maud Street Liverpool 8 Private 247 136230 E/L 191 352 CEM 9/1/26." [S45] Website FreeBMD (http://freebmd.rootsweb.com/) "Births Dec 1891 Jones Matthew Toxteth Park 8b 158." 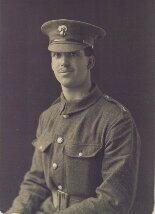 [S453] Short Service Attestation of Matthew Jones "His age was listed on the 7 May 1915 as 23 years 120 days. This gives a birth date of early January 1892, whereas his birth wa probably registered i nDecember 1891." [S449] Unknown author, 'unknown short article title', "Photocopy of article from an unknown date in 1916 re the detah of 4 Liverpol policemen. It includes photographs of all four." [S453] Short Service Attestation of Matthew Jones "unknown cd." [S450] Letter from A J Kear to Alan Bennett, 14th December 2001 "unknown cd." [S452] Unknown author, Map, 25 September 1916 "The map shows his batallion was alittle to the North West of Lesboeufs on the night Mtthew died." 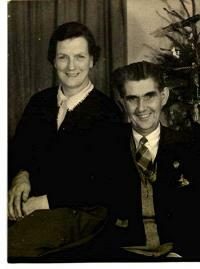 Residence* 1940� Robert Jones and Edith Jones lived in 1940 at 160 Park Road, Great Sankey, Lancashire, England, . 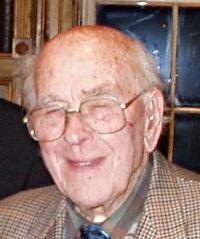 Illness* 1953� He was ill with (an unknown value) in 1953 at Buxton, Derbyshire, England, . GRO Reference: 1902 S Quarter in TOXTETH PARK Volume 08B Page 215." [S135] Marriages, St Mary, Great Sankey, 1945-1961 "p60/120." [S444] Copy death certificate of Robert Jones, 28 September 1957 "unknown cd." [S132] Burials, St Mary, Great Sankey, 1955-1968 "p18/137." [S2314] Website Toxteth Park Burials (http://www.toxtethparkcemetery.co.uk/dbase/toxsearch.htm) "Jones, William 21 April 1934 29 years - 120 Northumberland Street Toxteth Park Subsequent 6134 122342 E Left 191 352 CEM 9/1/24." [S40] UK National Census for 1851 for UK, "HO107/2177 f726 p56 201." [S76] UK National Census for 1841 for UK, "HO 107/564/12 f32a p15." [S40] UK National Census for 1851 for UK, "HO107/2177 f726a p57 201." [S454] Original marriage certificate of George Loughlin and Margaret Lloyd, 13 September 1897 "unknown cd." [S45] Website FreeBMD (http://freebmd.rootsweb.com/) "Deaths Mar 1900 Lloyd Joshua 61 W. Derby 8b 304." [S3852] Copy death certificate of Joshua Lloyd, 21 February 1900 "unknown cd." [S2869] Copy marriage certificate of James Dillon and Jane Choyce, 18 September 1909 "unknown cd." [S880] Website Ancestry (www.ancestry.co.uk) "Jane daughter of Joshua (carter) and Sarah Lloyd of Kirkdale baptised 26 April 1875 at St Peter. 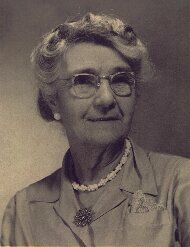 Born on 12 April 1875 ." [S943] Marriages, St Anne (Birkenhead), 1889-1919 "p62/123." [S37] Website Cheshire BMD (http://cheshirebmd.org.uk/) "Wirral : BK3/2/123." 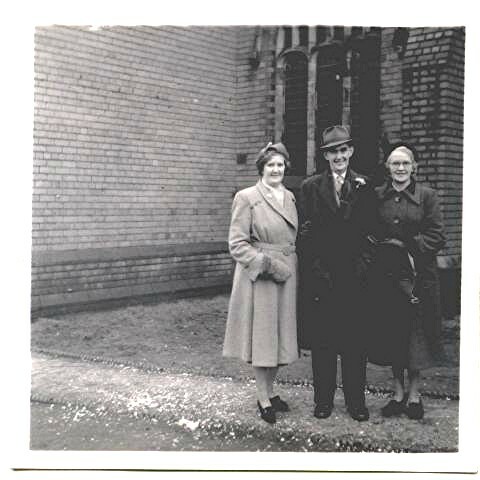 [S37] Website Cheshire BMD (http://cheshirebmd.org.uk/) "DILLON James CHOYCE Jane 1909 Birkenhead, Civil Marriage Wirral Cheshire BW/75/10." 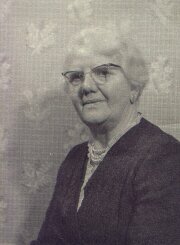 [S37] Website Cheshire BMD (http://cheshirebmd.org.uk/) "DILLON James LLOYD Jane 1909 Birkenhead, Civil Marriage Wirral Cheshire BW/75/10." [S45] Website FreeBMD (http://freebmd.rootsweb.com/) "Marriages Sep 1909 DILLON James Birkenhead 8a 1122." [S45] Website FreeBMD (http://freebmd.rootsweb.com/) "Marriages Sep 1909 CHOYCE Jane Birkenhead 8a 1122." [S70] General Record Office Indexes "Deaths Sep 1971 DILLON Jane 12 Apr 1875 (sic) Birkenhead 10a 36." Burial* after 2 September 1975� She was buried after 2 September 1975 at St Andrew, Kinson, Bournemouth, Dorset, England, ; outside the church door. 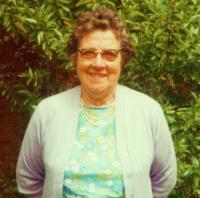 [S70] General Record Office Indexes "Deaths Sep 1975 Loughlin Margaret dob 23/10/1876 Bournemouth v23 p0053." [S880] Website Ancestry (www.ancestry.co.uk) "Margaret daughter of Joshua (carter) and Sarah Lloyd of Whittle Street baptised 11 November 1877 at St Alban (Bevington) by F A Power MA (Vicar). 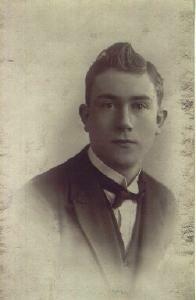 Born on 24 October 1877." [S1051] Website Lancashire BMD (http://lancashirebmd.org.uk/) "2053LP/84/325." [S534] Marriages, Our Lady & St Nicholas (Liverpool), unknown period "p163/325." [S311] Baptism, St Peter (Church Street), unknown period "p49/2/99." [S2260] UK National Census for 1911 for UK, "RG14PN22215 RG78PN1314 RD454 SD1 ED4 SN3." 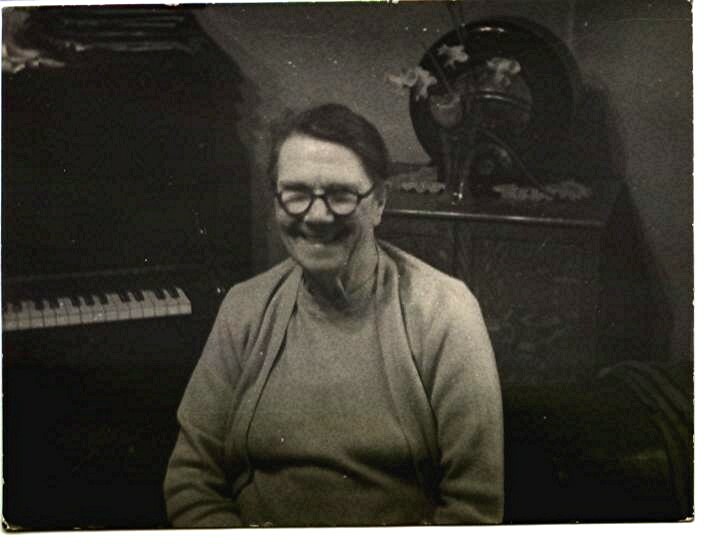 [S1865] E-mails from Sandra Bulloack to Alan Bennett, 2008- "unknown cd." [S56] Index to unknown record type, unknown second location, unknown period "LOUGHLIN, Margaret of 51 Millhams Rd Kinson Bournemouth died 2 September 1975 Probate Liverpool 26 September £3884 751608251J." [S311] Baptism, St Peter (Church Street), unknown period. [S3401] Copy birth certificate of Alfred Loughlin, 6 December 1910 "unknown cd." 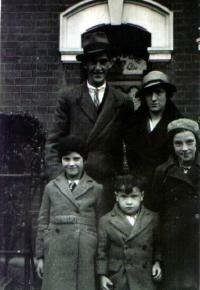 [S45] Website FreeBMD (http://freebmd.rootsweb.com/) "Births Dec 1902 Loughlin Daniel E M Toxteth Park 8b 176. 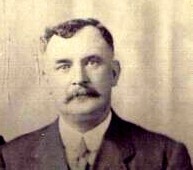 [S70] General Record Office Indexes "Death Mar 1904 LAUGHLIN Daniel Edward M 1 Toxteth P. 8b 146." [S605] Burials, St James Cemetery, Duke Street, Liverpool, 1890-1915 "p4589/52846." [S45] Website FreeBMD (http://freebmd.rootsweb.com/) "Births Jun 1905 Loughlin Albert Edward Toxteth Park 8b 206." [S439] Original marriage certificate of George Frederick Loughlin and Beatrice Brellisford, 25 June 1932 "unknown cd." [S3495] Copy marriage certificate of Alfred Loughlin and Edith Walker, 25 March 1940 "unknown cd." [S70] General Record Office Indexes "Marr Dec 1949 LOUGHLIN Albert E SATTERTHWAITE Liverpool N. 10d 358." 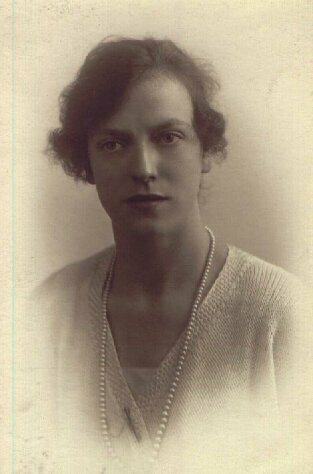 [S70] General Record Office Indexes "Marr Dec 1949 SATTERTHWAITE Mary LOUGHLIN Liverpool N. 10d 358." [S3775] Copy marriage certificate of Albert Edwin Loughlin and Mary Satterthwaite, 26 December 1949 "unknown cd." [S379] Copy death certificate of Mary Loughlin, 19 September 1978 "unknown cd." 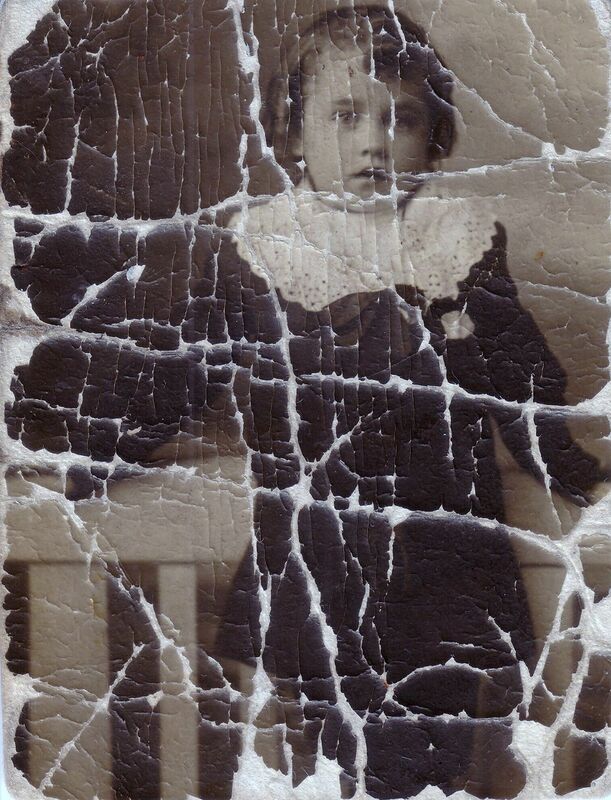 [S56] Index to unknown record type, unknown second location, unknown period "LOUGHLIN, Albert Edward of 357 Brodie Avenue Liverpool died 21 August 1991 Probate Liverpool 27 September Not exceeding £125000 9151708176V." [S381] Copy death certificate of Albert Edward Loughlin, 21 August 1991 "unknown cd." [S382] Unknown author, Funeral Estimate and Confirmation, 21 August 1991 "unknown cd." [S70] General Record Office Indexes "SEP 1909 LOUGHLIN Alfred Toxteth Park 8b 179." [S70] General Record Office Indexes "MAR 1910 LOUGHLIN Alfred 0 Toxteth Park 8b 102." [S605] Burials, St James Cemetery, Duke Street, Liverpool, 1890-1915 "p4698/54147." Biography � He was posted to serve in North Africa, where 'Monty' was preparing to take on Rommel and the Afrika Korps. Alfred faced a long detour to avoid U boats in the convoy out into the south Atlantic and down to Cape Town. 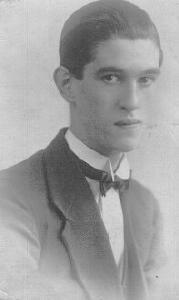 Here he disembarked and spent a period awaiting transport up through East Africa to Cairo. He had time to see the Pyramids, was also asked to preach in the Anglican Cathedral in Cairo (subsequently demolished as occupying a too prominent position in central Cairo and replaced on another site. Sent forward to serve as padre to many small forward air strips from which ground attack fighters were constantly flying close support missions for the 8th Army he had a busy and dangerous job. Monty and Tedder had pioneered a form of close air support which involved the RAF operating from close to the front line and from ground and air commanders living in close contact; in fact it pioneered what was later used with notable success in Normandy and the advance into Germany. But, although a war winning tactical method, it was often a costly in planes and aircrew, such low flying for accurate enemy interdiction exposing even experienced and skilful pilots to lethal AA fire. Alfred's task was to drive himself out into the desert, quite alone in a 15cwt. Dodge truck to the many exposed forward airstrips in order to take services, give pastoral care to all and to bury dead aircrew. This latter was frequently a duty that regularly and repeatedly involved conducting the burials of young airmen (average ages 19-23) he had previously got to know well, and dying of terrible burns; a heart rending responsibility. His travels involved facing not just the ordinary hazards of off road desert sand travel, high temperatures and mechanical problems, but enemy patrols in vehicles or from the air and Tuareg tribesmen (Saharan nomads) whose loyalties, either to the allies or to the axis, were always uncertain and potentially dangerous. Alfred used habitually to rely on a Red Cross (non combatant) card for safe passage, but on occasions his CO insisted on him carrying a side arm when passing through particularly dangerous areas. He spoke of the habit of stopping in his truck for such Arabs who 'thumbed' him down for a lift by placing his gun prominently on his knee when they climbed into the cab. 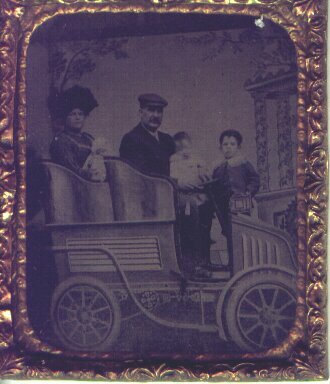 Photograph* � A Loughlin family group. 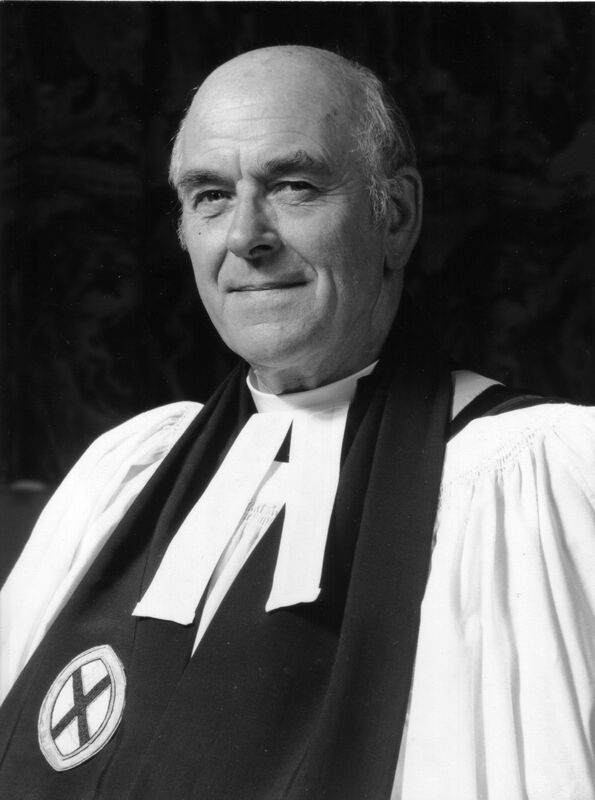 Occupation* 1975� He was a Canon and Preb in 1975 at Salisbury Cathedral, Salisbury, Wiltshire, England, . [S70] General Record Office Indexes "Births 1910 Mar Toxteth Park 8b 132." [S373] N/a, 'RAFVR Promotions', "10 March 1942." The Rev. Alfred LOUGHLIN (110962). 12 th Nov. 1941." 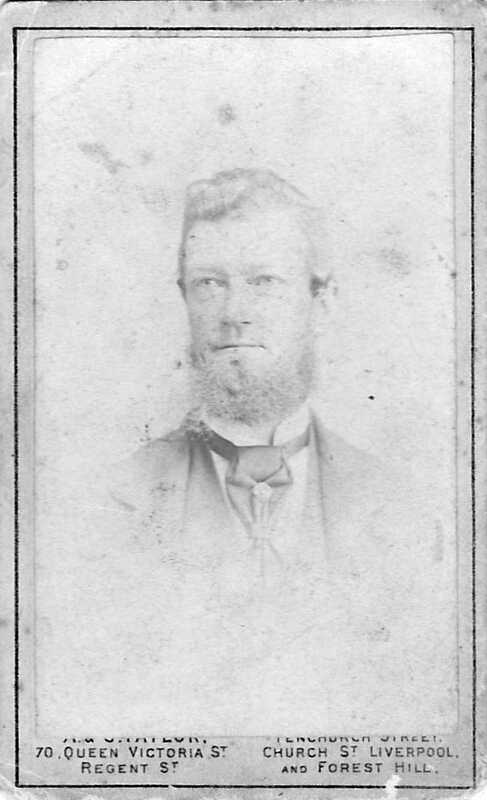 [S456] Obituary of George Frederick Loughlin "unknown cd." 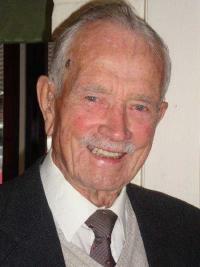 [S2411] Chloe Loughlin "He passed peacefully while holding his wife Edith's hand. She had just turned 99 - they have been married for 71 years." [S2847] Copy death certificate of Arthur Loughlin, 29 December 2011 "unknown cd." [S310] Microfilm Baptism, St John the Baptist (Toxteth Park), 1859-1871 "p108/860." [S517] Copy birth certificate of Alice Loughlin, 1 September 1863 "unknown cd." [S2] UK National Census for 1871 for UK, "RG10/3803 f140a p2 5." [S49] UK National Census for 1881 Index, UK "RG11 Piece 3640 Folio 60 Page 40." 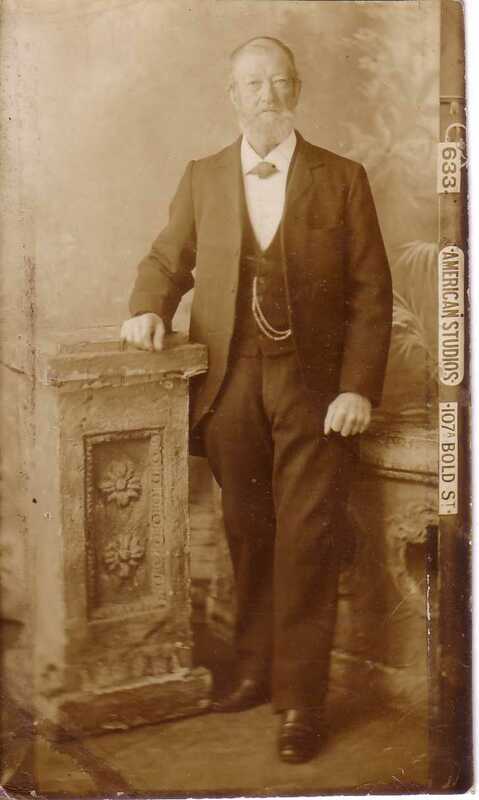 Spouse Father's Name: George Hawkes." [S45] Website FreeBMD (http://freebmd.rootsweb.com/) "Marriages Mar 1886 HAWKES John Henry Toxteth Park 8b 319. [S45] Website FreeBMD (http://freebmd.rootsweb.com/) "Marriages Mar 1886 LOUGHLIN Alice Toxteth Park 8b 319. [S1051] Website Lancashire BMD (http://lancashirebmd.org.uk/) "2065TP/1/275." 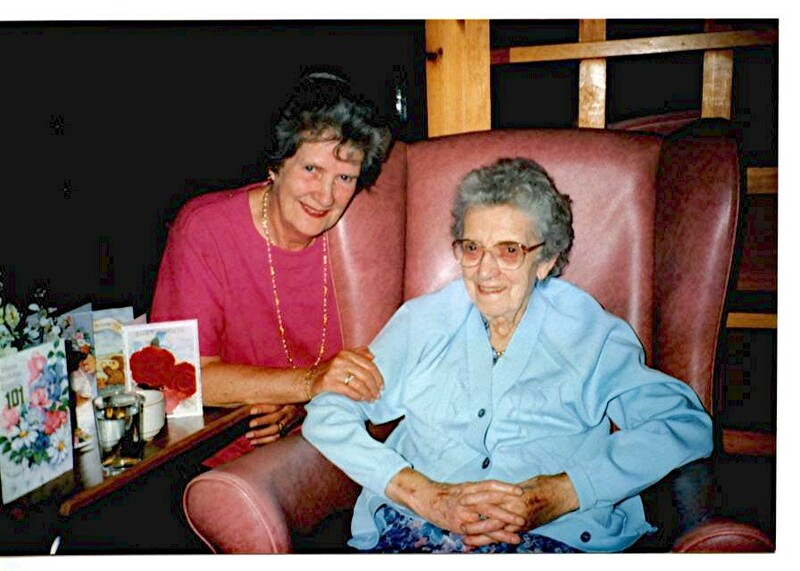 [S472] Madelaine Key, 4 May 2004. (Witness) Photograph � A Loughlin family group. [S45] Website FreeBMD (http://freebmd.rootsweb.com/) "Births Sep 1898 LOUGHLIN Alice Maud Toxteth Park 8b 169." [S880] Website Ancestry (www.ancestry.co.uk) "
[S3835] National Health Service Register for UK (online image) "Ref: RG101/4442D/018/16 Letter Code: NIWJ." [S1051] Website Lancashire BMD (http://lancashirebmd.org.uk/) "2121TP/4/288." Spouse Father's Name: Andrew William Pennington." [S1051] Website Lancashire BMD (http://lancashirebmd.org.uk/) "2064TP/6/421." 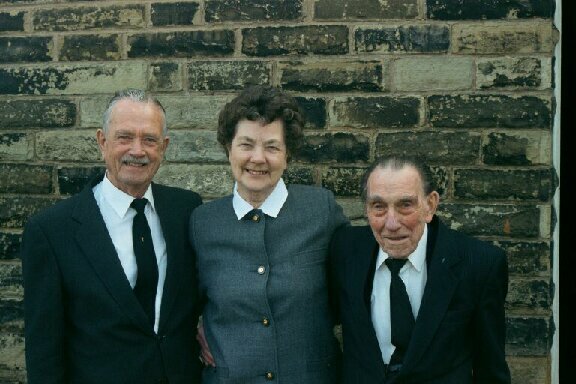 Charles (L) with his siste Jean and brother George at Jeans husbands funeral. 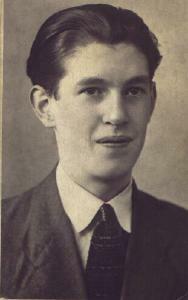 War* June 1940� He was called up for duty in June 1940 with the Kings Regiment (Liverpool) 11th Batallion. In November 1941 the batallion was mechanised and became 152nd Regiment Royal Armoured Corp . He became a tank instructor and hurt his back in a tank and was eventually demobbed through ill health. [S2424] Copy marriage certificate of Charles Arthur loughlin and Doris Irene Taylor, 1 June 1946 "unknown cd." [S70] General Record Office Indexes "Births LOUGHLIN Charles A 1912 Dec Toxteth Park 8b 356 LLOYD." [S2426] Copy death certificate of Doris Irene Loughlin, 2 January 1981 "unknown cd." [S2425] Copy death certificate of Charles Arthur Loughlin, 27 July 2012 "unknown cd." [S473] Copy marriage certificate of Daniel Edward Loughlin and DanieSarah Ann Wood, 30 September 1835 "unknown cd." [S40] UK National Census for 1851 for UK, "HO 107 2188 ED4 f490 p6 25." [S82] UK National Census for 1851 Index, Liverpool "2188/4 490." [S76] UK National Census for 1841 for UK, "HO 107/520/7 f44 p4." [S1088] Website Lancashire OPC (http://www.lan-opc.org.uk) "Marriage: 11 Aug 1856 St Peter, Liverpool, Lancs. John Loughlin - full, Shipwright, Bachelor, Crosshall St.
Martha Roscoe - (X), full, Spinster, Crosshall St.
[S47] UK National Census for 1861 for UK, "RG9/2701 f22 p89 214." [S310] Microfilm Baptism, St John the Baptist (Toxteth Park), 1859-1871 "p47/376." [S310] Microfilm Baptism, St John the Baptist (Toxteth Park), 1859-1871 "p190/1519." [S531] Marriage, St James (Toxteth Park), unknown period "p49/98." [S2403] Copy death certificate of Daniel Edward Loughlin, 5 May 1911 "unknown cd." [S2260] UK National Census for 1911 for UK, "RG14PN22299 RD454 SD4 ED21 SN9999." [S70] General Record Office Indexes "Jun 1911 Loughlin Daniel E 78 Toxteth Park 8b 144." [S605] Burials, St James Cemetery, Duke Street, Liverpool, 1890-1915 "p4719/54397." [S607] Microfilm Baptism, St John the Baptist (Toxteth Park), 1847-1859 "p85/618." [S436] Copy birth certificate of George Loughlin, 19 January 1866 "unknown cd." Photograph* circa 1916� A photograph of Edith in her teenage years. Residence* 1940� Edith Jones and Robert Jones lived in 1940 at 160 Park Road, Great Sankey, Lancashire, England, . 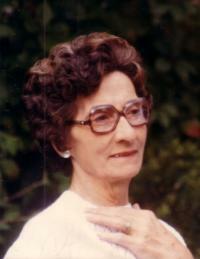 Photograph circa 1970� A photograph of Edith after her second marriage to Fred. [S70] General Record Office Indexes "SANDERSON, EDITH 27 July 1900 WARRINGTON 1989 February Volume No 35 Page No 1154 Reg No 289. 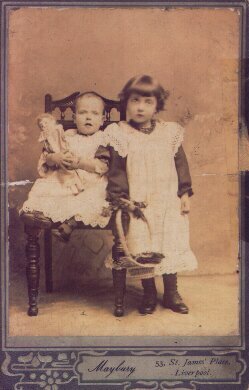 [S440] Copy birth certificate of Edith Loughlin, 27 July 1900 "unknown cd." GRO Reference: 1900 S Quarter in TOXTETH PARK Volume 08B Page 217." [S70] General Record Office Indexes "Marr Sep 1965 JONES Edith SANDERSON Newton 10f 65." [S70] General Record Office Indexes "Marr Sep 1965 SANDERSON Frederick W JONES Newton 10f 65." [S5] Edith Sanderson cremated 28 february 1989 Flag 477 Plot 36.